A funny thing happened on my way to updating this list of the 10 longest rail-trails in the US — I learned that not all the trails are suitable for bicycles. Of the 10 longest rail-to-trail conversions listed at the Rails to Trails Conservancy, 2 are established for ATV’s only and another is used as a scenic railroad with no adjacent path. A few others are surfaced with ballast, which can make bicycle pedaling plenty dicey. 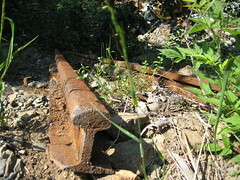 The longest rail-to-trail list was compiled by the Rails-to-Trails Conservancy. The non-profit has helped states, communities and volunteer groups turn 19,872 miles of abandoned railroad tracks into trails for many to enjoy. Another 9,232 miles are under development or construction. They are certainly to be applauded for their efforts. Here’s the ranking of the 10 longest rail-trails for bicycling. The three trails where bicycling is not possible are listed, but they’re not included in the Top 10 results. 1. Of the 1,600 rail-trails, the longest is the Katy Trail State Park that rolls along for 225 miles of Missouri countryside. The campgrounds, bed & breakfasts and other amenities that have popped long this route from Clinton to St. Charles are prime examples of how bicycle tourism can become a driving force of an area’s economy. The Bike Katy Trail website is a good place to begin exploring the trail. 2. The Cowboy Trail in Nebraska is the second longest at 195 miles with the opening of another section to Valentine. The rail-trail is the old Chicago and Northwestern Railroad and rolls across northern Nebraska. When complete, it will be 321 miles, the longest rail to trail conversion in the nation. Check out the Cowboy Trail Flickr slideshow ; also the Cowboy Trail state website as some sections have been temporarily closed due to flooding. 3. The Great Allegheny Passage runs up and over the Allegheny Mountains for 152 miles between Pittsburgh, PA, and Cumberland, MD. It’s the result of the combined efforts of 7 trails groups that linked up their sections of abandoned rail lines into one grand, off-road route. The rail-trail has seen a steady stream of bicyclists since it opened, stimulating the economies of small towns along the way. The Passage connects with the C&O Canal Towpath (not a rail-trail but a good trail) in Cumberland, which stretches for 180-some miles to Washington DC. 4. Milwaukee Road Corridor — John Wayne Pioneer Trail runs two-thirds of the distance across Washington state for 145 miles. After a 2-year closure, the 2.3-mile-long Snoqualmie Tunnel at the crest of the Cascades has been repaired and reopened to the public. Four other tunnels are closed with detours, although most are passable. The section east of the Columbia River to the Idaho border is reported to be in rough shape. Other stories at Biking Bis about John Wayne Pioneer Trail. 5. Flint Hills Nature Trail in northeastern Kansas passes through one of the last tallgrass prairie ecosystems in the world. The 117-mile trail was developed by the nonprofit Kanza Rail-Trails Conservancy. 6. George S. Mickelson Trail passes through the Black Hills of South Dakota for 110 miles, mostly through National Forest land. It has more than 100 converted railroad bridges and four tunnels over that distance. More information at the George S. Mickelson Trail website. 7. Paul Bunyon State Trail in Minnesota may not be the longest rail-trail in the nation, but it is the longest paved trail. The website reports 110 paved miles from Brainerd to Lake Bemedji State Park. It connects the Heartland Trail, Blue Ox Trail, and the Cuyuna State Trail. 8. Not surprisingly, the Blue Ox Trail is not far away. This 107-mile trail runs from Bemidji to International Falls through black spruce swamps and aspen forest. 9. The Wild Rivers State Trail rolls for 104 miles through northwest Wisconsin. It is primarily a snowmobile and ATV trail. The surface is compacted gravel in Barron and Washburn counties, but rough railroad ballast in Douglas County. Although the trail is open to bicycles, the state recommends off-road tire treads. 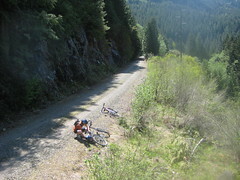 A reviewer recommends avoiding the trail as the large rock makes it difficult to hold a line, even on a mountain bike. 10. Michigan’s State Line Trail runs for 102 miles between Wakefield and Stager on the Upper Peninsula close to the border with Wisconsin. It crosses some 50 bridges; the trail surface is gravel and ballast. It’s another one where mountain bikes are recommended, rather than bikes with narrow tires. These are the longest rails-to-trails in the U.S. There are other long trails in the US, notably the east-west American Discovery Trail, the north-south East Coast Greenway and the Great Divide Mountain Bike Trail in the western US. They’re all worth considering for bicycle touring. I believe that the Great Allegheny Passage and it’s connected trail the C&O Canal trail comprise the longest continuous trail in the US now…. You can get on Your bike in Pittsburgh and ride all the way to our Nation’s capitol. Now they are not “one” trail… but that is in name only. Yes, the Great Allegheny Passage and C & O Canal trail are continuous at Cumberland, MD making for a wonderful 350 miles of trail from Pittsburgh to DC…done it 3 times. I was wondering if any of the rail to trails are suitable for horseback riding? I am looking for long trails to do trail ride through country on my Arabian horses. Would appreciate any information available. I have also done Pitt. To DC. Great trip, but the GAP is better maintained than the C&O. How long did it take you, and are there any camp grounds. Completed the trails 2 times, recently. Plenty hostels, little towns, B&B’s and tent sites on the GAP. Cumberland has hotel beside the trail. C&O has plenty tent sites, toilets, and most have pump water, also little tourist towns and motels/B&B’s. Both have food close by. We always carried a couple of days food but seldom use any, except snacks. We are leisure hybrid riders, some 30 to 50 mile days, never in a hurry!! Rides took us 7 days and 8 days but easy to knock off a day or two. It has been done in 1 day!! To be completely honest I think it’s b******* cuz all the old railroad tracks we’re great for our dirt bikes and them assholes took it away from us. Dirt bikers are scum. Trump supporters.